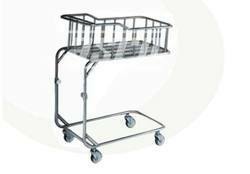 - Height adjustable from 850 to 1000mm. - Framework of Stainless Steel. Tubular pipe framework. CRC Sheet top with perforations. Mounted on 100mm diameter castor wheels, two with brakes. Back-rest adjustable on ratchet. With drop side-railings. Dimensions (LXWXH): 1480X840X600mm. Pre-treated & Epoxy powder coated finish. Size: L 105mm × W 45mm × H 1045mm – 855mm (Height Adjustable by hydraulic system). Teak wood heavily hand carved baby cot. Finished in white & multicolor in the carving. Choice of finishes. 1. Mild Steel tubular construction of 25 mm dia x 16 gauge thick. Mattress plane made of 0.8 mm thick CRCA sheet. Safety railing on four sides. Fitted with hook for hanging fluids. Mounted on four swivel castors of 50 mm dia. We are offering a qualitative range of Baby Cots to our esteemed clients at industry leading prices. 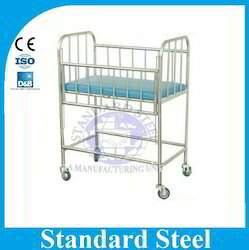 These cots are highly suitable for small babies and infants. Our range is provided with high metallic grills and a robust design for maximum protection. The wide array of baby cots finds huge demand in the competitive market for the durability, dimensional accuracy and high performance features.